To Scare Voters Toward McCain ? Or Will He Have Israel Do It? 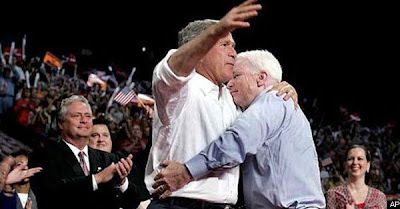 Many who have watched the tactics of this Bush Administration sense a plot to come up with something that will scare the American voters toward McCain, the step needed to continue the master plan of the Bush Regime. Some feel that the plot involves an attack of some kind on Iran, either by the U.S. or Israel. Keep in mind, there are a lot of people making bigggggg money on this 'war on terror' and they are going to go down swinging. But an attack on Iran would simply show that this Regime looks at our sons and daughters (soldiers) as expendable pawns. THIS CAN NOT BE TOLERATED !!! Below is an article from Huffington Post for everyone to read. It should also be noted, if Bush does attack Iran, ALL Americans will then know to what extreme this administration will go to continue their master plan....all the more reason why EVERYONE should vote for A True Change....BARACK OBAMA ! "Do you think that the Bush administration will attack Iran before the general elections in November?" I asked Congressman Henry A. Waxman (D-Calif.) in his office in Washington. He said this is impossible, and explained that Congress will not support the administration due to the current situation in Iraq and Afghanistan. He also mentioned that since the release of the National Intelligence Estimate, which clarified that the hardliner government in Tehran had halted Iran's nuclear weapon program in 2003, the possibility of going to war with Iran has decreased dramatically. But I received differing and worrisome answers on the question from the other side of the political spectrum, indicating that the mood of majority Democrats in congress is not the dominant mood in Washington. For example, one of the strongest scenarios among neo-conservatives is based on the hypothesis that in the case of any military attack against Iran -- even a limited air strike -- the greatest beneficiary among the three presidential candidates would be John McCain. The reason for this is that the American people's first priority would become national security instead of the economy, and since there might be a "perception" that McCain would deal with foreign policy issues better than economic ones, he would have a stronger chance of winning in November. In addition to bolstering McCain, they believe that a strike would also bring the Islamic Republic of Iran to its knees for its defiance over the nuclear program, its alleged involvement in Iraq and meddling in the Middle East process by supporting groups like Hamas and Hezbollah. If an attack occurs, democratic nominees will be framed as weaker potential commanders-in-chief -- Senator Obama is talking about engaging in dialogue with U.S. adversaries while the perception of having Sen. Clinton in the White House during wartime, seems unfavorable. The Republicans have already paved the way for action against Iran by passing the Kyle/Lieberman bill, which labels Iran's Revolutionary Guard a terrorist organization for its involvement in supplying and arming the insurgents in Iraq (and consequently killing American troops). This bill, which Senator Clinton and Senator McCain have endorsed, is the first in recent history to label a faction of a sovereign government as a "terrorist organization." Patrick Clawson, a senior scholar in a hawkish institute in Washington told me that the arrest of four Iranian diplomats in northern Iraq in January 2007 has been effective in deterring Iranians and that it is in the interest of the United States to pursue this path. He also argued that the UN Security Council's sanctions against Iran have been somewhat effective. However, he claimed there are still members of Al-Qaeda in Iran that hardliners in Tehran have refused to hand over to the Americans, hence making Iran an easy target. No wonder President Bush called Iran the most dangerous threat against the United States along with Al-Qaeda earlier last month. The implication of his statement is clear: in the so-called war on terror, the United States is not only fighting with Al-Qaeda, a radical Sunni group, but also with Iran's Revolutionary Guard, which is basically a part of Iran's official army. In fact the stage is set for an attack, more likely an air strike, on Iran. President Bush suffers from the lowest approval rate and some of his closest allies have left the White House. Additionally, military officials continuously complain about the role of Iran in Iraq as well as Tehran's defiance in stalling its nuclear program. President Bush can save the day for Republicans by ordering a military attack against Iran. Only last month Adm. Michael Mullen, chairman of the Joint Chiefs of Staff and the nation's top military officer, said that "the Pentagon is planning for potential military courses of action" against Iran. Surprisingly, this is not something that terrifies hardliners in Tehran. Many believe that any kind of military attack by the United States will enhance Iran's position in the Muslim World, and that Iranians will rally behind the flag in support of the government. Unlike the Republicans' perception that in case of an attack people will come to the streets and celebrate, as in Baghdad in 2003, radicals in Iran do not see a military attack on Iran as detrimental. Simply because such an attack will only mobilize patriotic Iranian people behind their government, even though many of them hate the government, and in the long term will only strengthen the hardliner's position in power. Given this scenario, come November, there will be a Republican president in the White House, a continuing hardliner government in Iran, and a decimated region with no hopes for peace, human rights or democracy. SUPPORT THE TROOPS....BRING THEM HOME !!! !